It’s common to find numbers stored as text in Excel. This leads to incorrect calculations when you use these cells in Excel functions such as SUM and AVERAGE (as these functions ignore cells that have text values in it). In such cases, you need to convert cells that contain numbers as text back to numbers. Now before we move forward, let’s first look at a few reasons why you may end up with a workbook that has numbers stored as text. Using ‘ (apostrophe) before a number. A lot of people enter apostrophe before a number to make it text. Sometimes, it’s also the case when you download data from a database. While this makes the numbers show up without the apostrophe, it impacts the cell by forcing it to treat the numbers as text. If you extract the numerical part of a text string (or even a part of a number) using the TEXT functions, the result is a number in the text format. Now, let’s see how to tackle such cases. In this tutorial, you’ll learn how to convert text to numbers in Excel. The method you need to use depends on how the number has been converted into text. Here are the ones that are covered in this tutorial. Using the ‘Convert to Number’ option. Change the format from Text to General/Number. Using a Combination of VALUE, TRIM, and CLEAN function. When an apostrophe is added to a number, it changes the number format to text format. In such cases, you’ll notice that there is a green triangle at the top left part of the cell. Select all the cells that you want to convert from text to numbers. Click on the yellow diamond shape icon that appears at the top right. From the menu that appears, select ‘Convert to Number’ option. This would instantly convert all the numbers stored as text back to numbers. You would notice that the numbers get aligned to the right after the conversion (while these were aligned to the left when stored as text). When the numbers are formatted as text, you can easily convert it back to numbers by changing the format of the cells. Go to Home –> Number. In the Number Format drop-down, select General. 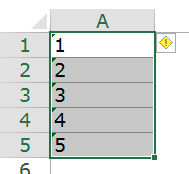 This would instantly change the format of the selected cells to General and the numbers would get aligned to the right. If you want, you can select any of the other formats (such as Number, Currency, Accounting) which will also lead to the value in cells being considered as numbers. Enter 1 in any empty cell in the worksheet. 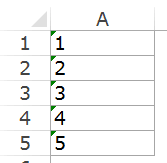 Make sure it is formatted as a number (i.e., aligned to the right of the cell). Copy the cell that contains 1. Select the cells that you want to convert from text to numbers. 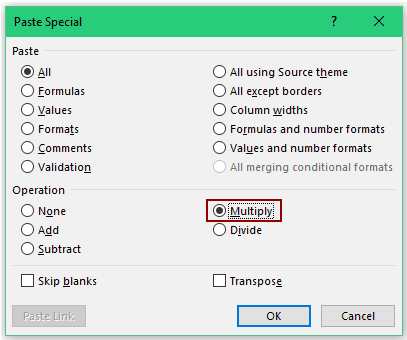 In the Paste Special dialog box, select Multiply within the Operation category. This method is suitable in cases where you have the data in a single column. 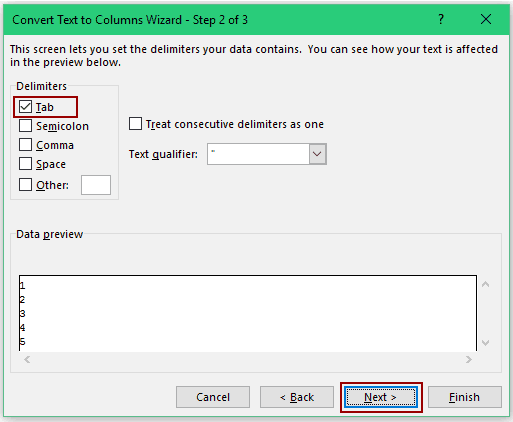 Go to Data –> Data Tools –> Text to Columns. In Step 1: Select Delimited and click on Next. 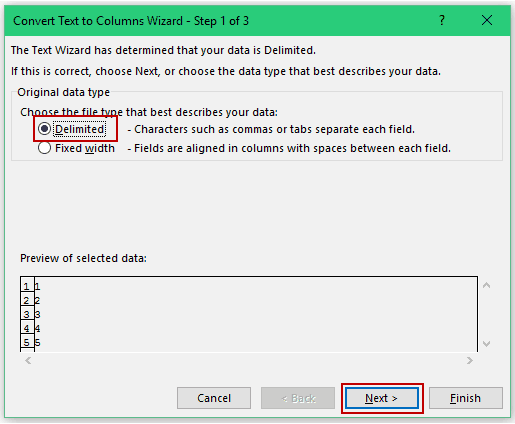 In Step 2: Select Tab as the delimiter and click on Next. 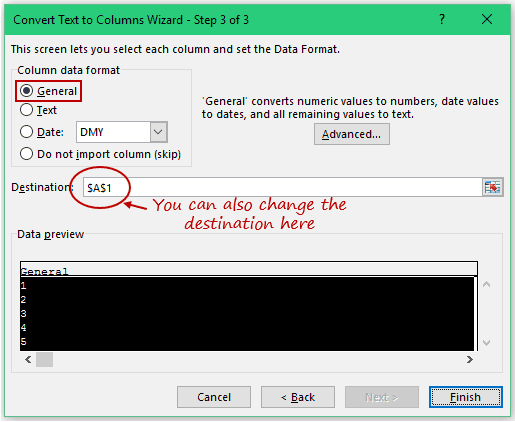 In Step 3: In Column data format, make sure General is selected. You can also specify the destination where you want the result. If you don’t specify anything, it will replace the original data set. While you may still find the resulting cells to be in the text format, and the numbers still aligned to the left, now it would work in functions such as SUM and AVERAGE. You can use a combination of VALUE, TRIM and CLEAN function to convert text to numbers. VALUE function converts any text that represents a number back to a number. TRIM function removes any leading or trailing spaces. CLEAN function removes extra spaces and non-printing characters that might sneak in if you import the data or download from a database. If you want to apply this to other cells as well, you can copy and use the formula. 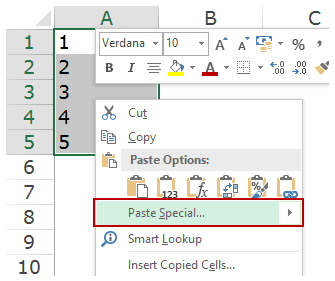 Finally, you can convert the formula to value using paste special. Multiply in Excel Using Paste Special. Convert Formula to Values Using Paste Special.